Home » Exhibitions » Audubon's Birds of America: Selections from the "Amsterdam Edition"
In recognition of an important recent acquisition, the Fairchild Gallery presents Audubon's Birds of America: Selections from the "Amsterdam Edition", with vivid illustrations by naturalist and artist John James Audubon (1785 -1851). In early 2005, the Georgetown University Library received a generous gift of selections from the so-called "Amsterdam Edition", a handsome set of a "double elephant folio" (39 7/16 x 26 5/16 inches) of high-quality photolithograph reproductions faithful to Audubon's original illustration sizes. The Amsterdam Edition was produced between 1971 and 1972 by the Johnson Reprint Company, of New York (U.S.A.) and Amsterdam (The Netherlands). Prof. Gary Filerman, Director of the Health Systems Administration Program at Georgetown University's School of Nursing and Health Studies, and Melvin Goldfein were the donors of the Amsterdam Edition, adding a landmark work to the Library's strong collection of art on paper from the United States. 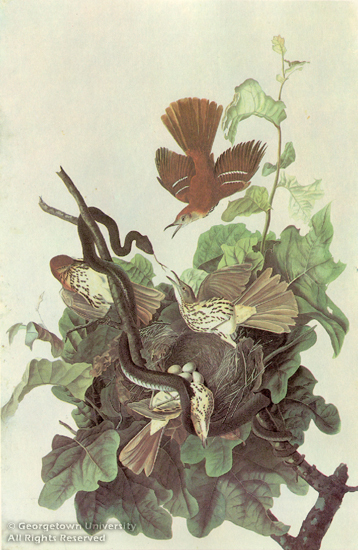 Several works will be shown that reflect the interest of Audubon's era, before and after his own life, in recording, cataloguing, and depicting specimens from nature, including a color wood engraving of a magnolia branch from the rare Natural History of Carolina, Florida and the Bahama Islands (1743) by Mark Catesby. About Thomas Nuttall, the wide-exploring botanist and ornithologist of whose specimens Audubon copied several, and whose 1834 Manual of the Ornithology of the United States and of Canada is included in this exhibition, Audubon remarked that he was "a gem...after our own heart." 4 Natural scientist James DeKay, who was the editor of the first paper that Audubon presented, compiled the mammoth and well-illustrated Zoological Report of New York State (from 1842), of which a volume on ornithology is included here. Later nineteenth- and early twentieth-century artists Frederick Polydore Nodder, Louis Agassiz Fuertes, and Robert Ridgway, all inspired by Audubon's example, are represented in the exhibition. 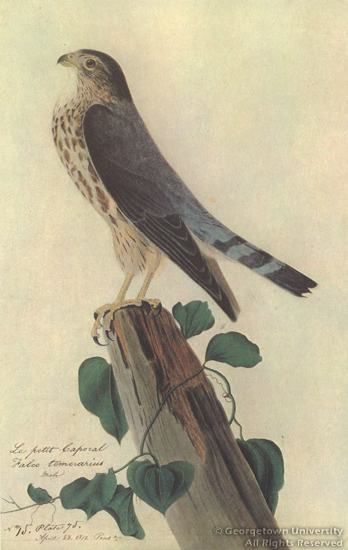 John James (né Jean-Jacques Fougère) Audubon was born in Haiti and was reared in France. He emigrated to Pennsylvania at age eighteen. 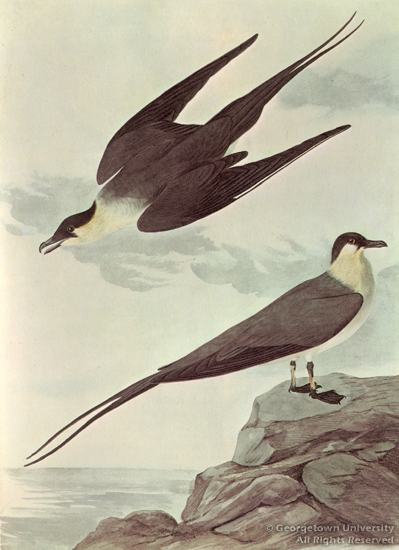 Intrigued by the natural wonders of North America, and inspired to surpass in technical proficiency the work of earlier ornithological illustrators, the self-taught Audubon spent many years of travel and study, as far west as Yellowstone and from Labrador to the Gulf Coast of Texas. 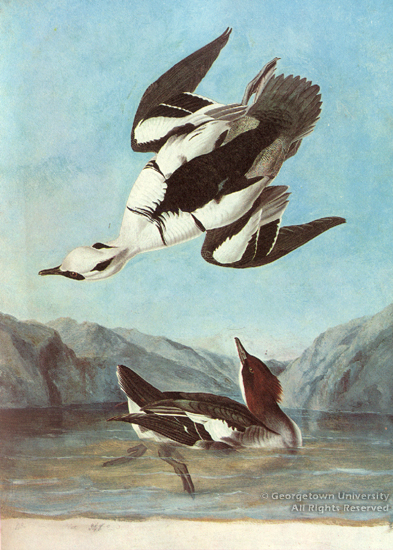 Unable to find an engraver and publisher in the U.S. for his drawings and paintings of birds, he succeeded in having a four-volume set published in London between 1827 and 1838, to great acclaim. Subscribers eventually included George IV, and Canada's Parliament. Audubon's life and career had been plagued by a number of misfortunes, such as failed businesses, losses of his artwork, and, most terribly, losses of children. 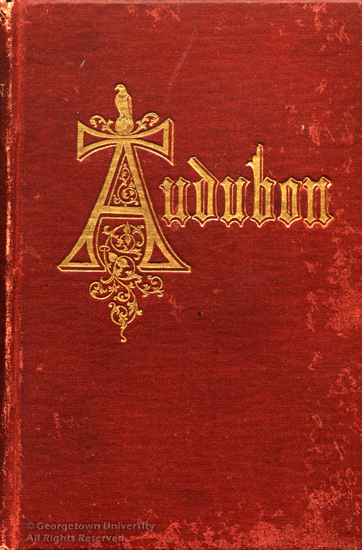 A rare 1869 edition of Audubon's first biography, edited by his widow Lucy, is included here. The late eighteenth and nineteenth centuries saw a proliferation in the pursuit of knowledge, with landmark achievements in science being among the most important. In the United States, concurrent with the exploration of the North American continent and the growth of cities and towns from coast to coast, there was the gradual establishment of modest schools, colleges, museums, and other centers of learning that eventually would constitute the infrastructure for this increase and preservation of learning. The student of Audubon's work must be attentive to the use of nomenclature and spelling in the descriptions of his paintings. In a number of cases, the common names that Audubon used for particular species are not those used today, and some reference works will employ the current names or spellings, which can create some confusion when attempting to match a work with a descriptive entry. (Discrepancies may be due either to changes in convention or, in a number of cases, to identification errors made by Audubon. 11) For this exhibition, we are using the names that Audubon used as they appear on the reproductions of the original etchings. Indicative of the enduring interest and fascination in Audubon's contribution to the nation's cultural and intellectual history, Audubon's Birds of America: Selections from the "Amsterdam Edition" is on view at Georgetown University concurrent with Audubon's Dream Realized: Selections from The Birds of America at the National Gallery of Art. 1 Robert Brown, "Identifying Audubon bird prints: originals, states, editions, restrikes, and facsimiles and reproductions," in Imprint (Autumn 1996). The viewer will note with interest that six original plates owned by the American Museum of Natural History were restored in 1985 and used to print an edition of 125, in commemoration of the two-hundredth anniversary of Audubon's birth (Duff Hart-Davis, Audubon's Elephant: America's Greatest Naturalist and the Making of The Birds of America (New York: Henry Holt and Company, 2004): 273). 2 Some biographers have speculated that Buffon's work likely would have been known in the household of Audubon's French upbringing; see Shirley Streshinsky, Audubon: Life and Art in the American Wilderness (New York: Villard Books, 1993): 15; and John Chancellor, Audubon: A Biography (New York: Viking Press, 1978): 32. 4 Streshinksy, 277; see also Chancellor, 201–03. 5 See Kathryn Hall Proby, Audubon in Florida (Coral Gables: University of Miami Press, 1974). 6 Quoted in Duff Hart-Davis, Audubon's Elephant: America's Greatest Naturalist and the Making of The Birds of America (New York: Henry Holt and Company, 2004): 271. 7 Hart-Davis, 184. 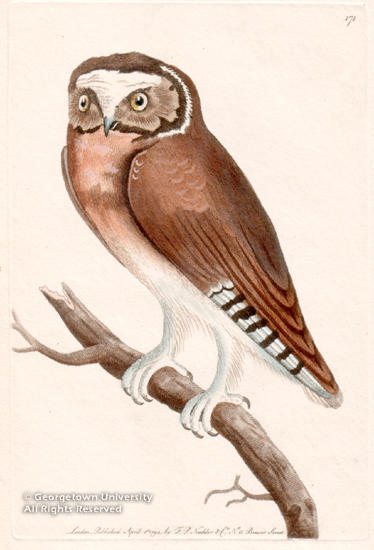 Charles Bonaparte was a fellow ornithologist with whom Audubon had had relations of mixed amicability, and is known for such works as A Geographical and Comparative List of the Birds of Europe and North America, and Birds of Mexico. 8 David Knight, The Age of Science: The Scientific World-view in the Nineteenth Century (New York: Basil Blackwell, 1986): 113. 9 Letter to Edward Harris, quoted in Hart-Davis, 226. 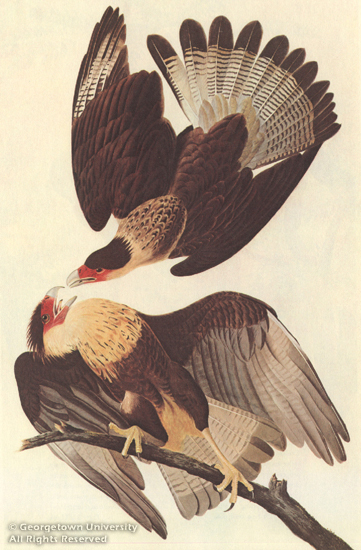 Above: Brasilian Caracara Eagle, Polyborus vulgaris; Plate CLXI from The Birds of America. * Duff Hart-Davis, Audubon's Elephant: America's Greatest Naturalist and the Making of The Birds of America (New York: Henry Holt and Company, 2004): 271. * Excerpt from Ornithological Biography, reprinted in Kathryn Hall Proby, Audubon in Florida (Coral Gables: University of Miami Press, 1974), 135. This image, one of the most magnificent in the Georgetown University Library's collection from the Amsterdam Edition, was reprinted in Georgetown, the University's official alumni magazine, in recognition of the generous donation of these prints to the University. * Excerpt from Ornithological Biography, reprinted in Kathryn Hall Proby, Audubon in Florida (Coral Gables: University of Miami Press, 1974), 91, 94. 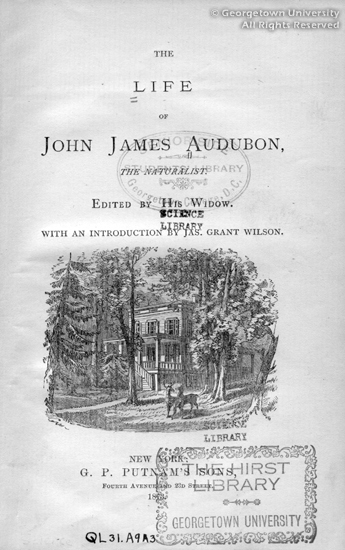 Audubon published his Ornithological Biography, or an account of the habits of the birds of the United States of America, in Edinburgh in five volumes between 1831 and 1839. 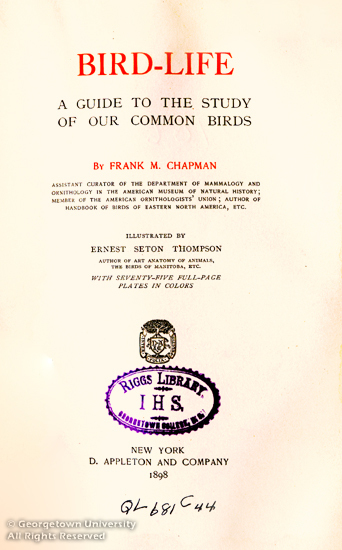 Intended to amplify and accompany his Birds of America, the Ornithological Biography provided detailed observations of the physical properties and characteristics of each species, his reactions to them, and in some cases the best method of capturing or hunting them. * Duff Hart-Davis, Audubon's Elephant: America's Greatest Naturalist and the Making of The Birds of America (New York: Henry Holt and Company, 2004): 177, 182. "Travellers of all nations are fond of possessing the upper part of the head and the bill of the male... I have seen entire belts of Indian chiefs closely ornamented with the tufts and bills of this species, and have observed that a great value is frequently put upon them." An article in the April 2005 issue of the journal Science claimed that the ivory-billed woodpecker had been seen or heard in Arkansas, but this has not been confirmed, to the satisfaction of other ornithologists, by any concrete evidence. 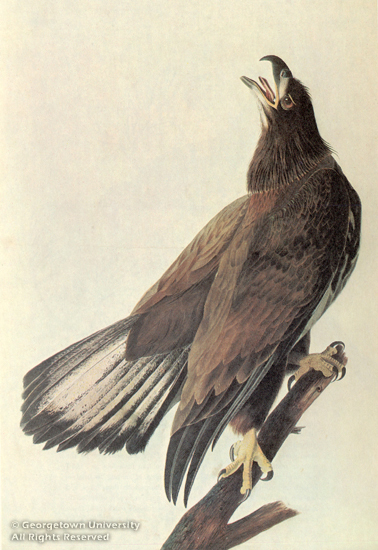 The Amsterdam Edition plate of the magnificent Caracara Eagle, described in volume 4, also is displayed in case S5. 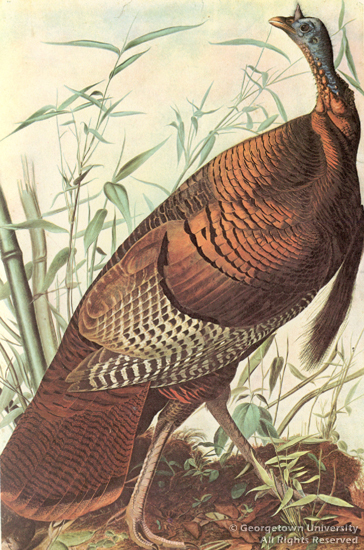 The Life of John James Audubon, the Naturalist. (orig Charles Scribner's Sons, 1897; this edition New York: Dover Publications, 1960; two vols.). 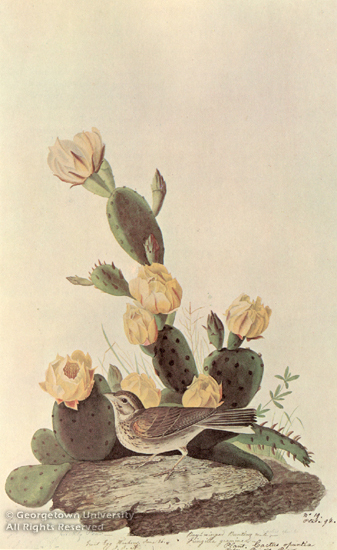 illustrated with plates, engraved and colored from original drawings taken from nature. 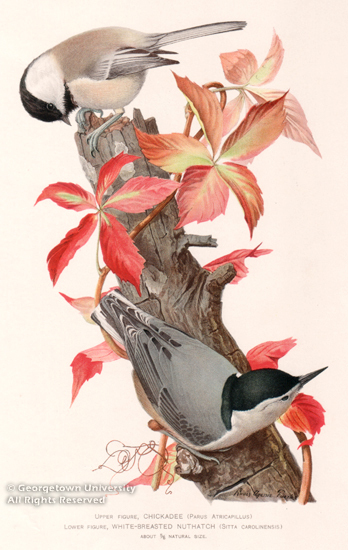 The relationship between Audubon and the Scottish-born writer and illustrator Alexander Wilson has been a source of both historical interest and partisan contention since the years when the two ornithologist's lives and work overlapped, beginning with a fateful meeting on March 18, 1810, in Louisville, where Audubon was engaged as a merchant. They met again in Philadelphia in the summer of 1812. 4 John Chancellor, Audubon: A Biography (New York: Viking Press, 1978): 58. 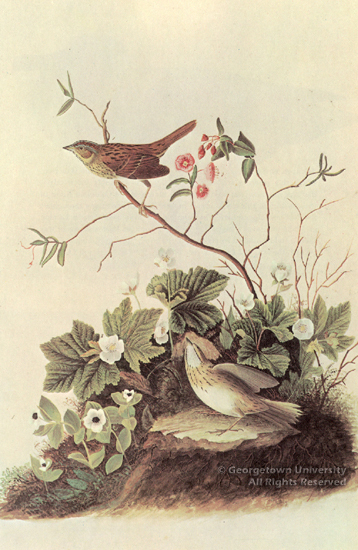 Here we have shown, as a useful comparison, Alexander Wilson's depiction of the Ferruginous Thrush, next to John James Audubon's more dramatic composition. The English naturalist Mark Catesby published his groundbreaking Natural History of Carolina, Florida and the Bahama Islands in London between 1734 and 1741, following two expeditions to the southern colonies facilitated by the benevolence of native American guides. Catesby systematically collected plant and animal specimens, took detailed notes, and made copious drawings of local flora and fauna. 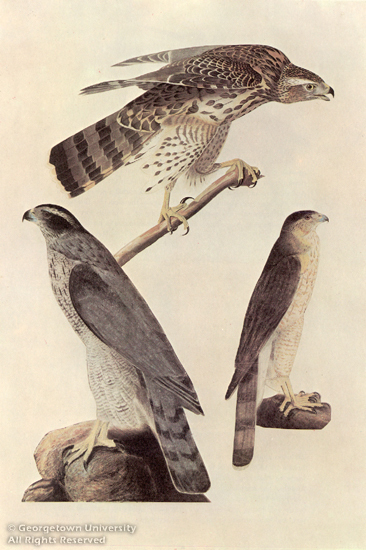 Recognized as the first great publication on American natural history, Catesby's work depicted birds and mammals in their natural surroundings, establishing the precedent for successors such as Alexander Wilson and John James Audubon. Catesby's system of naming species, which recognized inherent relationships between animals and birds, was influential to Linnaeus's system of binomial nomenclature and its application to indigenous American species. On July 4, 1833, George Washington Parke Custis, the step-grandson of George Washington, donated to Georgetown College his family's copy of Catesby's tome. While in America doing research for the History, Catesby had stayed for a time with Custis's great-grandfather, John Custis of Williamsburg, whose name was inscribed on the volume's title page. The book also was owned by George Washington at Mount Vernon before coming ultimately to Georgetown, where it now is housed in the Library's Special Collections Division. 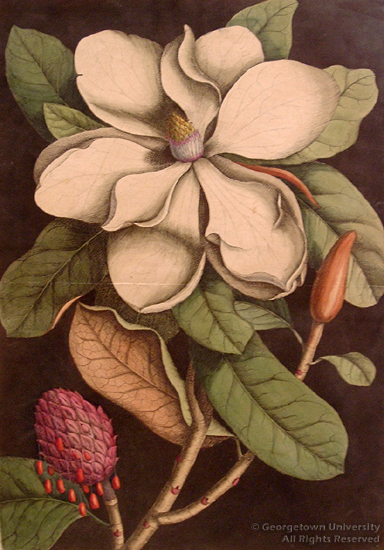 This plate illustrating the magnolia flower and foliage was folded in half and inserted unbound into the Natural History. In order to reproduce his original illustrations, Catesby learned to etch his own plates, and supervised the laborious hand-coloring process as well. 1 John Chancellor, Audubon: A Biography (New York: Viking Press, 1978): 32. * John Chancellor, Audubon: A Biography (New York: Viking Press, 1978): 202. 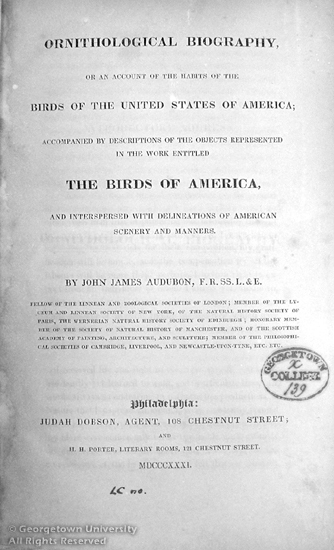 As noted in the exhibition introduction, Portuguese-born James E. De Kay was the editor of the first paper that Audubon presented; this volume of his Zoology of New-York on birds contains bibliographic citations to six of Audubon's works, including The Birds of America and Ornithological Biography. 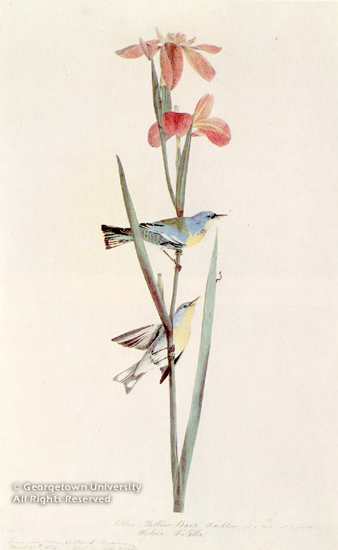 English immigrant illustrator John William Hill , who prepared chromolithographs for the volume, had established his reputation first as a topographical artist, and was an associate of the National Academy of Design. Bird-life: A Guide to the Study of Our Common Birds. Illustrator Ernest Seton Thompson (or, in some sources, Ernest Thompson Seton) was a British author and illustrator of nature guides and outdoor life, who worked in Canada and the United States, and who was a founder of the movement that led to the Boy Scouts. * Anne Becher, American Environmental Leaders, from Colonial Times to the Present, vol. 1: A-K (Santa Barbara: ABC-CLIO, 2000): 170-72. * The Dictionary of National Biography. The Concise Dictionary, Part 1... (London: Oxford University Press, 1953): 86-87. Cyanocitta Ultramarina, Var. Arizonae AD. 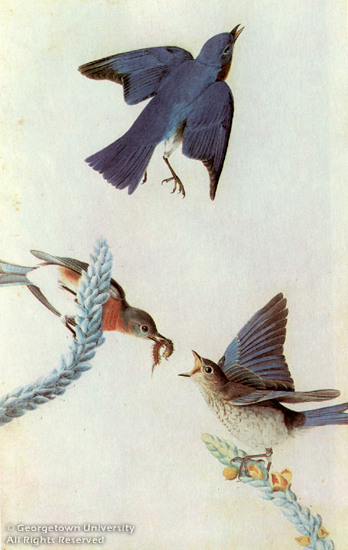 This chromolithograph of the Western scrub-jay, native to Arizona, was drawn by Robert Ridgway, the first curator of ornithology at the U.S. National Museum (now Smithsonian Institution) from 1880 until his death in 1929. Ridgway collected bird specimens while serving as a naturalist on Clarence King's geological survey of the 40th Parallel, a major map-making program in 1867 that stretched from the mountain ranges in Wyoming to the California coastline. 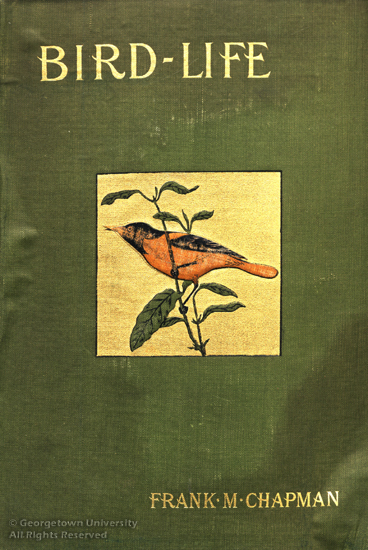 Ridgway's expertise attracted the attention of Spencer F. Baird, first secretary of the Smithsonian Institution, who assigned Ridgway to his post at the Institution and co-authored several books and journal publications with him, including the multi-volume History of North American Birds - Land Birds (Boston: Little, Brown & Co., 1874), the most likely source of this loose plate. Reproduction, A related illustration was published in Farmers' Bulletin no. 513: Fifty Common Birds of Farm and Orchard (Washington, D.C.: U.S. Dept. Of Agriculture, 1913). 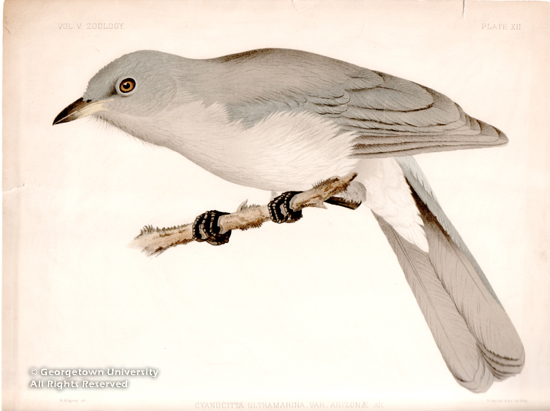 Louis Agassiz Fuertes became fascinated with birds at a young age, and was profoundly inspired by Audubon's illustrations for Birds of America, which he first saw on a visit to the local public library with his father. Agassiz was among the scientists and artists on the 1899 expedition along the Alaskan coast, led by Edward H. Harriman. As with Audubon, he sketched from dead birds, and went on to become the foremost ornithological artist of his time. 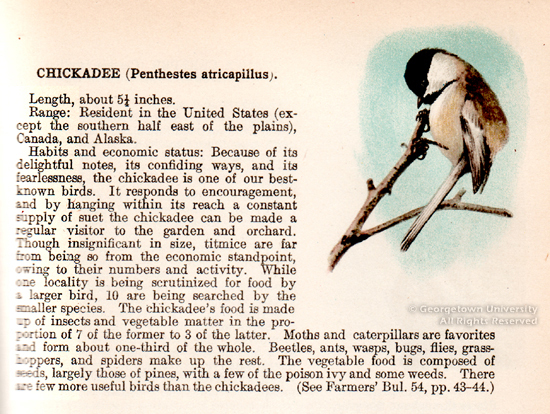 A variation of this illustration of the chickadee was published in the Farmers' Bulletin 513: Fifty Common Birds of Farm and Orchard (Washington: U.S. Government Printing Office, 1913), p. 9. - Text by Art Collection Curator LuLen Walker, and Art Technician David C. Alan. 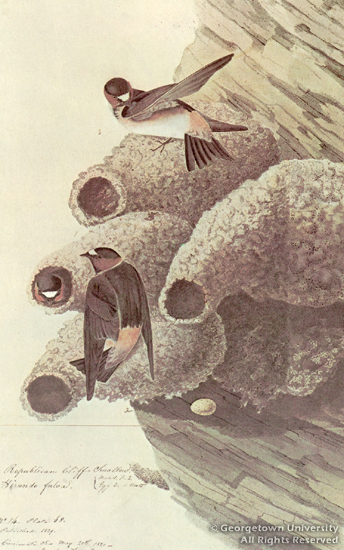 The following persons are acknowledged for their contributions to and assistance with Audubon's Birds of America: Selections from the "Amsterdam Edition": Prof. Gary Filerman, Director of the Health Systems Administration Program at Georgetown University's School of Nursing and Health Studies, and Melvin Goldfein were the donors of the "Amsterdam Edition". Assistance was provided by Marty Barringer, Associate University Librarian Emeritus for Special Collections; Karen H. O'Connell, Reference Librarian; and David Hagen, Graphic Artist with the Library's Gelardin New Media Center.